A sparsely furnished room gives two guys in suits a place to stand and wait. A rough disposition covers them, the kind of guys you imagine have seen and done most of it anyway. Yet beneath this grimy coating, nervous anticipation seeps through no matter how bad Brutus (Aaron Suggs) and Titus (Glenn Widdicombe) try to hide it. Bill has this effect on people. Another outcast joins them, a devilishly innocent looking fella. Two more arrive soon after, barely on theatre time. 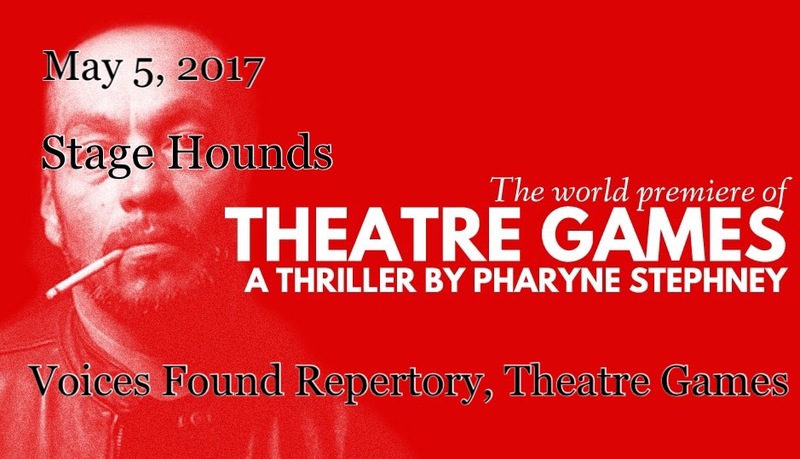 These strangers get familiar really quickly, as the plot of Theatre Games thickens around the characters Pharyne Stephney developed in her debut play. The theatre director’s daughter, known only as Princess (Alexis Furseth) to this anonymous actor’s guild, waltzes in, to start a dangerous charade of impromptu theatre Bill is ready to see. She too has played a role in her father Bill’s (Greg Ryan) productions before. She’s interrupted an intense warm-up that the player’s initiated without direction, theatre games if you will. With malicious banter, they take note of each other’s stage presence and talent, prodding for tenderness in the each others skin to draw blood from; searching for the right pecking order among them. Quelling their anticipation, Princess gives them all a script containing only their character’s part. To keep their identities concealed from one another, they must refer to each other by their character names. Brutus and Titus have a clear edge. With nothing to prove, they’re willing to deflect and return a few barbs headed towards Othello’s face back at Romeo (Oliver Wolf). Romeo doesn’t relent easily. Othello (Jacob Ortiz) shows his erratic and testy persona uncontrollably, not wanting nor accepting that he needs help among this company. The last character MacBeth (Jake Russell Thompson), looks like a rabbit in den of foxes, backed in a corner, wide-eyed, oblivious and skittish. They’ve all come to this theatre to play their role for the money, at the whim and mercy of Bill’s maniacal desires. The problem is nobody ever knows the content of those desires until the curtain has already closed. A two-act drawing directly and admittedly from the shallow well of Quentin Tarantino’s film legacy, Theatre Games tells a convoluted story of secrets, lies, manipulation and betrayal that most noticeably references the Tarantino centerpiece Reservoir Dogs. Theatre Game’s premise transposes key character qualities and story structure from Reservoir Dogs, including transposing salutation-plus-color-named characters for famous Shakespeare character names as pseudonyms, and mimicing the famous scenes were the thugs are holed up with each other and dueling wits to figure out who snitched. Stephney’s story succeeds most in its departures from Tarantino’s films. The action of Reservoir Dogs revolves around a bank robbery, and the conflicts that arise after the gang botches the job. Central to Theatre Games, the job and role of each of the players is shrouded in a web interpersonal drama between the actors, keeping the audience mostly blind as to what end the hooligans are working towards. In this ambiguity, Stephney weaves a rampantly interesting tale. Embedded in the stage directions Stephney takes audience members, uninitiated to life behind the third wall, backstage to learn widely held superstitions, courtesies and semblances of how actors get primed for the stage. Stylistically, Russell Thompson, who also directs Theatre Games, does well animating Stephney’s story. The play’s blocking and lighting contribute to the composition of the scenes in unexpected ways. Most notably upstage moments (relying on deliberate body language from players not involved in the dialog) get permission to lend to how we understand the story to unfolding. Suggs uses these opportunities naturally without being in the dialog, magnifying dimensions to his character he establishes well with convincing and focused script delivery. Going between awkward and brilliant, Ortiz gave a performance reeking wonderfully (purposefully or not) of the constantly exasperated classic performance that Steve Buscemi deliverd as Mr. Pink in Reservoir Dogs. As Romeo, Wolf puts ample effort into portraying an irascible sociopath, the type of person who looks solid and rational at first glance only. Widdicombe and Furseth in their supporting roles offer a steady balance to the production. Burgeoning stand-by of independent theatre, Ryan uses his reliably sturdy persona, rich baritone voice and imposing physicality to make Bill an ominous spectre compelling Theatre Game’s underworld into motion. Eric Schmalz (assistant director/producer), Caroline Boettcher (stage manager), Suggs (lighting designer), Furseth (pyschology dramaturg) and Bridget Anderson (dramaturg) worked together behind the scenes to make Theatre Games a show. Voices Found Repertory Theatre’s production of Theatre Games has a short run with remaining shows Friday, May 5 and Saturday, May 6 at 7:30p and Saturday, May 6 and Sunday, May 7 matinees at 2:00p in the Arcade Theatre in the lower level of the old Grand Avenue Mall. This entry was posted on May 5, 2017 by L.S. Trolley. It was filed under Local Trolley .